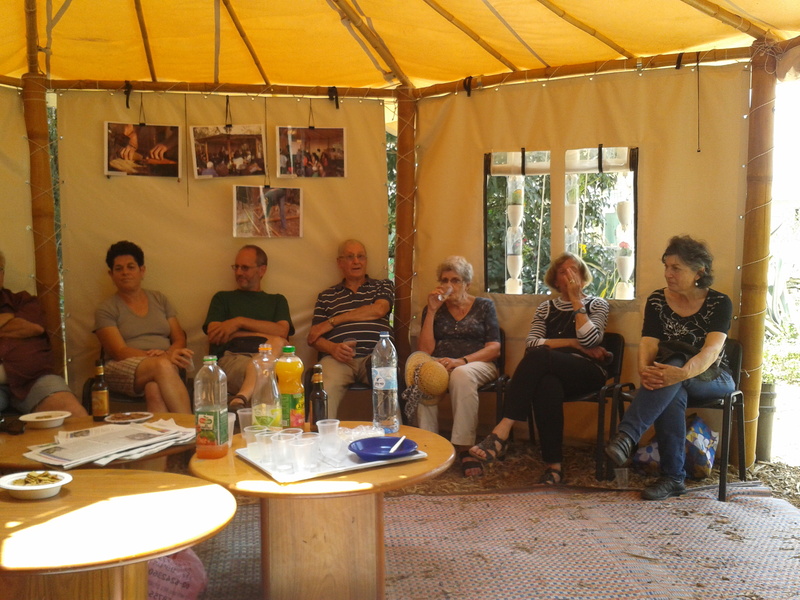 On Friday morning, June 13, we met about 20 Servas members at the beautiful Communal Garden at the Natural History Museum in Jerusalem's German Colony. We began with a round of those present: Members told of interesting guests that they hosted and or about their experiences as Servas travellers. We met two new members to Servas Jerusalem: Dalia Shay who teaches hebrew at Ulpan Beit Ben Yehuda, and Elena Levitsky who made Aliyah from Moscow four years ago, where she was already Elena is active on Gilo's neighborhood local newspaper. Together with Ana Or they wrote an extensive article on Servas that was published this month. Shosh Yitzhaki from central Israel also participated in our meeting. The Highlight of the meeting was an extensive explanation and tour of the garden with Amnon Herzig, volunteer and the moving spirit behind this wonderful community garden. We learned about the history of the garden and how a handful of caring residents decided to invest in the garden to prevent it being sold for real estate and construction. We learned how to grow plants in creative recycled containers that save about 80% of the water consumption for irrigation. We wandered through the expansive garden and saw how the volunteers had gradually bit by bit turned the former wilderness into a blooming garden with trees, shrubs, vegetable patches, colorful flower beds and small ponds with water plants and ornamental fish. We finished our tour at the nursery where potted plants can be purchased. Later Mike told us about Meira's and his experiences during their last trip to Catalonia, stressing that their Servas friends and hosts enabled them to visit the unbeaten tracks and wonderful areas usually unknown to tourists. Revital told us about her fascinating work in 'Brain Games' a private clinic for ADHD and other neurological disorders. The Neurofeedback treatment is based on unique and innovative technology. Meir gave information on future Servas activities: Christmas in Israel with Servas and plans to mark the International Day of Peace on 21.09.14 . Finally, we sat together in the shade of the exotic garden tent for light refreshments and small talk. All the participants enjoyed the event surrounded by the beauty and unique atmosphere of the garden. We encourage Servas members to visit the garden on Thursday afternoons and to join in the fun by volunteering there.